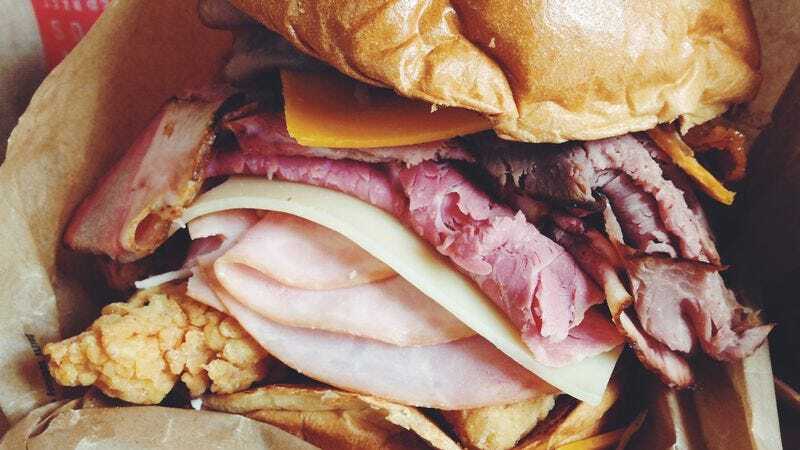 Enter Arby’s Meat Mountain. The Ohio-founded chain spent years specializing in one thing, and one thing only: roast beef. Over the past decade it’s tried to break out of that box by offering a line of Market Fresh Sandwiches, which introduced meats other than roast beef, and attempted to alter the brand’s place in the fast food chain. No amount of sliced deli meats could truly change the company, at least not in the way it had seemingly hoped. So as it rolled out its new “Meet The Meats” campaign it decided to go for broke and—under the guise of a “patrons wanted this and were ordering it off menu!” story that we find dubious at best—offer one sandwich that included every roasted, cured, and fried meat it had, giving it an equally sizable name in the process: the Meat Mountain. In order from the top down, that’s one bun, three half-strips of bacon, 1.5 ounces of roast beef, one slice of cheddar cheese, 1.5 ounces of Angus steak, 1.5 ounces of brisket, 1.5 ounces of corned beef, one slice of Swiss cheese, 1.5 ounces of ham, 1.5 ounces of roast turkey, two chicken tenders, and another bun. When The A.V. Club’s associate editor Marah Eakin emailed me a link to the Meat Mountain and challenged me to tackle it, there wasn’t a question about whether it would happen, only a matter of when. After establishing a time to convene at the summit’s base, we headed to the closest Arby’s we could find, which is in the food court of the massive Merchandise Mart, a building appropriately large—and with just the right amount of alliteration—to make it a fitting home for the challenge. After approaching the counter, and being greeted by a friendly Arby’s employee, I asked for the monstrous sandwich. Marah had wisely printed off a handy one-sheet explaining the sandwich and its preparation in case this location wasn’t familiar with the “secret” menu item, a problem The Wire ran into when it attempted the feat. But, I was met with a small chuckle and a question I was not entirely ready for: “Do you want a combo or just the sandwich?” A combo? I was about to eat every meat this establishment had to offer, an estimated 1,200 calories and 48 grams of fat. Did I need the combo? No, I most assuredly did not. Did I want the combo? Yes. Yes I did. I decided to augment my Meat Mountain with an order of curly fries (mozzarella sticks were also an option) and 40 ounces of water, a safe bet, as adding carbonation to this mix would surely prove disastrous. When I asked the cashier if other people had been ordering the sandwich she replied, “You’re the first, actually.” And, with my ego thoroughly boosted, I planted my feet and dug in. Three of our compatriots also decided to crest the mountain, but after two of the sandwiches were ordered and assembled, the Arby’s location temporarily ran out of brisket. I assumed after four they’d have to close for the day on account of depleted meat resources. Despite The Wire’s claim that the sandwiches were over one-and-a-third iPhones tall, this one actually appeared somewhat manageable. Sure, it was a lot of food, but it was also just a really big sandwich, not a mound of meat I had to climb and then consume. Though I am not opposed to such a thing. I put it next to my face for comparison, and while it’s not as tall as the Mega Mega Stuf Oreo I recently ate, it was still quite bulbous. From the very start I’d believed that the rumors of Meat Mountain’s grandeur had been somewhat exaggerated—as hyperbole is part and parcel of such creations—and that first bite helped prove my theory. As I bit down I nabbed a piece of every meat and just a little bit of bun. Equipped with the knowledge that I could get my mouth around the sandwich, it seemed like a foregone conclusion that the challenge would be completed. That first bite gave me confidence but also showed the sandwich’s flaws. With so many meats all fighting for a finite amount of taste buds, the meats with the saltier preparations (corned beef and chicken tenders) won out. From there, each bite offered something slightly different but no less overwhelming. At times I’d get more notes of the company’s signature roast beef, but it was always fleeting since this was really just a glorified pile of meat between two buns. By my fourth bite I was beginning to hit a wall and feel full, but I was mostly just tired of eating the sandwich. The amount of chewing that goes into eating a sandwich of this size is exhausting. Even my smallest bites were followed by tens of seconds of chewing and mashing, with the occasional sip of water to help expedite the process. I knew I could get this sandwich in my stomach, but working it into chunks suitable for swallowing was proving the hardest part. As I continued on, new challenges availed themselves to me. At a certain point, it was nearly impossible to stifle the gases that came barreling up my esophagus, releasing themselves freely for all diners to hear. My stomach began to tighten and my jaw was getting sore, but I was more than halfway through and I could see the tip of the precipice with my own eyes. Also, it was comforting to know I was eating a sandwich in a food court and not actually climbing a mountain, so if I did fail it wouldn’t mean I’d freeze to death on my descent. When those final bites came I wasn’t fully prepared for what was in front of me. Even as my two buns sat on the wrapper, depleted to a point where they were barely intact, between them remained a portion of each and every meat. The chicken tenders hadn’t slid out, the roast beef was still hanging on, and the rest of the gang was there, too. Even the curly fries that writer Katie Rife asked me to put on the sandwich remained, mangled and mushed. I opened my mouth, chewed my final piece of the Mountain, and finished. Out of impulse (one possibly rendered because my insides were rapidly constricting) I flung my arms into the air in triumph. I had bested Meat Mountain! Or so I thought. As our fellow climbers finished, the effects of the sandwich began to hit me. For no real reason I’d get a chill and my body would shake, a startling occurrence that happened every couple minutes. The gas that was filling me continued to be released without my control, which was nothing if not charming for all those in attendance. And, perhaps most notable, when I laughed my left side was met with a tight pain around my ribs. It turned out I wasn’t alone in such agonies, as the three other finishers uttered similar statements, with one of them even claiming he felt “feverish” for the rest of the day. The experience may not have been glamorous—and the aftermath even less so—but the Meat Mountain is far from impossible. By this point, it’s become more publicity stunt than secret menu item and, to that end, the real winner here is Arby’s. As much as I can pontificate about besting a sandwich, Arby’s still got my $14 (the combo with the extra-large drink bumped the sandwich’s cost up from its base price of $10). Kudos, Arby’s. I’ll see you again, likely when you introduce the Horsey Sauce Waterslide.